Today, we are talking about free stuff. 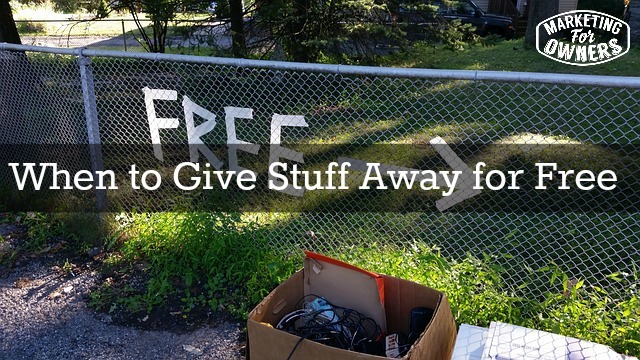 Very simply sometimes you are going to have to give away stuff for free. The reason I wanted to say this was because of the fact that, a friend of a friend was advised to make an offer of a discount to get people into his store. But he said No! This is one thing I am not doing – I am not doing any discounts. And our advice was to actually give the discount to get very targeted customers into the door to make their first purchase, because these people buy over and over and over again. So, he was thinking that if he gives a discount, it will give something away that people will always expect discounts. No! They won’t because it’s made very clear. So in this case we are advising not to give free, but say he makes 50 % on his products. We say give the person about a 40% discount (these by the way are influences), we are advising to give a tour of the store to such special influences. Give them a voucher that has their name written on it, and it has 30 days to expire and has a 40 percent discount. Now if they spend it, they are buying your products and then you will impress them, and it gives you a chance to impress them with your service and your product and then they will come back. If however, they don’t spend it, it doesn’t cost you a penny. But it’s going to make them buy something from your shop. They possibly weren’t going to buy anything as they are not your current customers and then you will get them to buy again. Now this is the same with the free stuff. Say you are a garden service and you want some more customers. Why don’t you drop them some leaflets and say, “First come first serve for anyone who books two lawn mowings or yard cleanings. We will give you the first one free to prove to you how good we are”. Do you think someone is not going to book two for the price of one when they wanted one anyway? Of course not! And what happens is that you get two attempts to impress and give that first impression. Because obviously you are very good at what you do. Aren’t you? It seems you think you are. You should be proud of what you do, you should expect that people will be impressed. If you don’t think that people are going to be impressed by what you do, what you offer, what you sell or your service, perhaps you should consider getting someone else to do it or getting another job. I am going to suggest that you probably, if you listen to this, are very good at what you do and you need to know that you are very experienced and the reason that you have customers is because you are very good at what you do. So get some more customers and impress them too. So give them that free one, so they can be impressed. If it’s a type of thing that people are going to buy again, then of course if you sell a product that is a one off or if you just sell a commodity item that the people don’t buy often and they can buy anywhere, it doesn’t really matter, because it’s like buying milk from grocery store. They don’t give things like that away for free. It has to be something that is worth doing, that you want people to buy regularly. Now you can offer an incentive. If you know how much people spend on average in one visit, you can give them some money off. Let’s say people spend $20, then you can turn around and give them $10 off. You are not going to lose money — just work out the numbers but you are going to make them think they are going to act and you are going to get a the chance to impress them with your service. You haven’t lost your money, you haven’t given it away for free. You are still going to be above break, even probably you are going to get a chance to show them what’s going on. I am keeping it short and sweet today because it’s a concept you need to get inside your head and think about it. All of the direct mail people who sent out free samples, who sent out pieces, who gave special offer at the front, they are all doing that in the back of the Sunday papers, the magazines, the trade magazines and all of that. They are all doing it because they know there are back end sales. When you bought something they have you as a customer. You are no longer a prospect. You are a customer. You can then sell them more things and make off with them and talk to them in a different way. So as it goes, they have been doing it for hundreds of years or well a hundred years. Try it. Today is Wednesday. Now today is a friendly follow. I am recommending Sarah Evans, she is a PR Junior. She is absolutely fantastic. So her twitter handle is @prsarahevans and if you go along there, she has got like a hundred and six thousand followers last time I looked but she has so many people sending direct tweets at her. Obviously expect a PR person to be good. But this is how to be social. 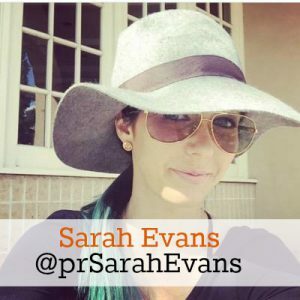 If you want to know how to chat to people on social media, go and watch what Sarah Evans does. It’s very impressive. Oh I haven’t mentioned lately. If you want a freebie from me, go to marketingforowners.com/freebook and what it does is explains if you give a rating and a review on iTunes, I have something for you and you can test it. It doesn’t matter about your whereabouts and where ever you are. You will get something brand new for free at my expense from amazon. Go and see what happens. Come back tomorrow. I’ll see you then. What could you give away for free?